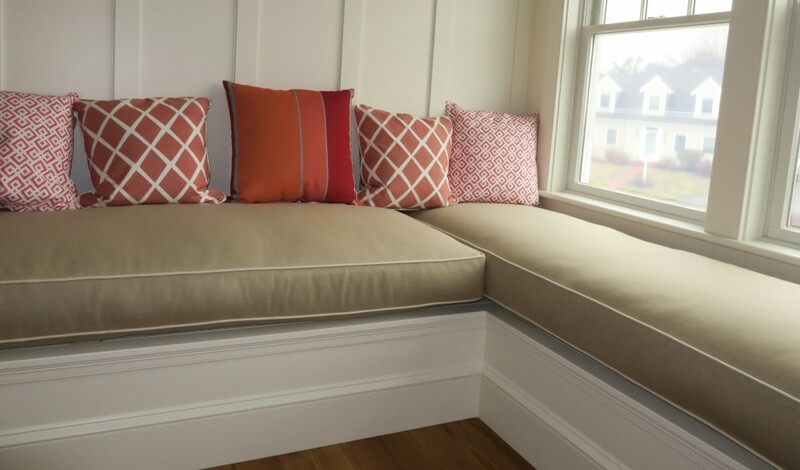 This entry was posted in General Upholstery, Local Cape Cod, Upholstery How To and tagged blog, Cape Cod, Cape Cod Upholstery Shop, Dropbox, interior design, Joe Gramm, upholsterer, upholstery by Joe Gramm. Bookmark the permalink. Sorry, but your link does not work. I appreciate your effort with the pictures. But I can’t tell a where & what you’re trying to attach to the back. I know it’s the inside back you’re trying to attach to the back frame, but I can’t tell from the photos how it all happens. Partly what is throwing me off is your cushion is not stuffed. Normally the cushion would be stuffed before attaching. The only way I could help would be if I could see a photo with the cushion stuffed and all it’s parts. Then a photo of just the chair back frame. I am recovering my sofa and can’t seem to get the curve on the arm just right–it keeps puckering. I have tried cutting into the seam as the curve turns to allow the fabric to lay on top of each other instead of folding but that did not help. I tried stuffing pieces of batting up under the seam (desperate move) and that helped a little, but I still am not pleased. I reused the welt from the previous sofa–could little twists and bumps in the previously used welt be sinking my ship? I saw a tutorial that suggested using steam from an iron to straighten puckered seams–useful? Should I rip out the seam and put it in again? Also, SO I spread the seam apart, fold all to the back or all to the front? I don’t see any photos. I never reuse welting cord. Steam can help depending on the fabric content. You can also check the tension on your sewing machine. Hi, I hope you’re well. I found a 1960’s Egyptian Revival style chair on the sidewalk and, I love it so much. The seat needs to be redone. It’s designed as fabric covered upholstery webbing strung in a basket weave formation with a gentle swag, sort of a fabric covered hammock. To me, it seems there was a knife edge pillow as the seat cushion, or at least that is what I would like to make for it (the original cushion was not with it). – Is there a trick or any tutorials you know of for covering webbing with upholstery fabric? – Any thoughts or experience with a knife edge pillow as a seat cushion? – Mohair or velvet are what come to mind (after leopard fur!!!) for fabrication when I look at the piece but there will be top stitching involved in covering the webbing. Have you ever seen top stitched mohair or velvet? -Can I use a regular sewing machine for something like this? I’m open to any suggestions you might possibly have. I haven’t really had any jobs needing webbing to be covered. Two methods come to mind. Sew a tube made from your finished fabric. Slide your webbing into it and then sew a topstitch on both sides to secure the fabric. Or, just wrap your fabric around the webbing and sew a topstitch all in one step. I would think you’d need an industrial machine to be able to sew thru three or more layers of mohair plus the webbing. As for the seat cushion, I’d need to see a photo of the chair to see what would work. I have a Victorian love seat that belonged to my grandparents. It has a scroll back with roses carved in the mahogany wood. But what I’m most interested in is finding out about the fabric. A cream background with the most beautiful floral design throughout. The flowers have a sheen to them almost like they were hand sewn with silk thread. Do you know anything about this kind of upholstery? Thank you! Sorry for the late reply. The sheen is probably from either silk or rayon. Both can have a sheen. I don’t know anything particular about the fabric on your Victorian piece. You know the old saying, “A picture is worth a thousand words”. Photo wouldn’t help with my question. Almost finished with a chaise. Had some trouble locating good quality button covers. The completed buttons squeak. I can lightly press on some and I will either hear a clicking sound or squeak. Am going to leave the bottom open, no dust cover, in case some of these fail?? I use three or so types of buttons and never had a problem with squeaking or clicking. It must be a brand specific problem you are having. Go to an upholsterer who has a standard button press and have them make the buttons. If it were my shop, I would let you make them yourself for free. Others may charge a nominal fee if they make them for you.